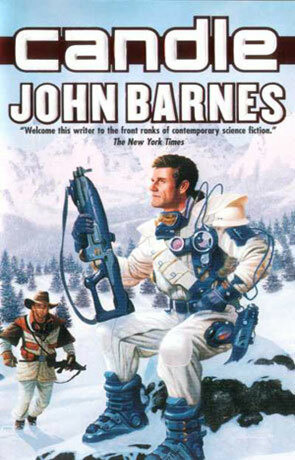 Candle is the third volume in the Century Next Door series by the author John Barnes. Barnes, just keeps on getting better and better. Candle is clearly his best book to date, which says a lot. Currie is an old man, when the global controlling super mind, called One True, asks him to take on the task of hunting down the last "cowboy". A cowboy is basically somebody who isn't under the control of the meme called Resuna and through Resuna, One True. Currie fails and ends up the prisoner of the cowboy Lobo, who he tells the story of how he became the last cowboy hunter. And that is where Barnes really shines. Telling the story of Currie as he lives through the later part of the 21th century, Barnes tells an amazingly bleak story, but manages to make it human, by keeping our focus on Currie. Barnes returns to the idea of the meme (also explored in Kaleidoscope Century), not just as a weapon, but as the controlling forces behind the different sides of the war. This is where the story gets really interesting as the questions of what level of personal freedom one can expect and just how much of your personality you can give up and still stay you. I don't say this very often, but I am actually capable of saying this: I thought that this book was too short. I would really have liked fifty or a hundred pages more detailing the ideas of it and the life of Currie. Written on 2nd January 2002 by TC.